I got this email from Organizing for Action last week, but with the Thanksgiving holiday and everything else I didn’t get the chance to write about it until now. There are a lot of people on the other side up in arms right now about the President’s immigration plan, and I’m having trouble understanding why. Or they think that 500 days isn’t long enough to wait for John Boehner to hold a vote on the bipartisan reform bill the Senate passed. Most Americans are tired of the excuses. As someone on the other side, perhaps I can explain why so many of us are up in arms against President Obama’s recent actions regarding immigration. First, it is often said that our immigration system is broken, yet somehow no one ever explains how the system got broken. The simple truth is that our immigration system is broken because there a large number of people in Washington DC who simply do not wish for our current immigration laws to be enforced. There are a number of motives involved and this is a bi-partisan issue. Suffice it to say that many members of this country’s political elite want to have effectively open borders while most ordinary Americans of both parties do not. The system is broken because those in charge of maintaining the system want it broken. Aside from the immigration issue, many Americans are wary of unilateral executive action by the president without regard to the wishes of their representatives in Congress. Even Americans who might agree with the provisions of Obama’s orders dislike the manner in which he has enacted them. This idea that either Congress rubber stamps what ever the President demands or he will issue rules by decree seems more suited to the days of absolute monarchy or some third world dictatorship than to a free republic under the rule of the constitution. This by now famous sketch from Saturday Night Live neatly demonstrates the misgivings many Americans have over the Obama method of getting things done. And it’s no good claiming that previous presidents have taken similar actions with executive orders on immigration. As David Frum pointed out in his article in the Atlantic, these previous presidential executive orders were clarifications of existing legislation that affected relatively few people. They were not attempts at passing new laws from the Oval Office. I have a parable in mind that perhaps will help Mr. Shapiro, and others, understand our point of view. Suppose I decided that I wanted a new car, perhaps something a bit sportier than what I now own. My wife, however, explains that the family finances are such that we cannot afford a new car and that anyway my current vehicle works perfectly fine for my needs. I then drive my car into the nearest telephone pole, totalling it. I go back to my wife and explain that since now my car is broken, I really need a new one. She responds that the finances are in worse shape than before from the expenses of the towers taking the car away and my medical bills so that I will have to walk or take a cab. I decide that if she wants to block progress and not take action, I will so I take executive action and go and buy a new car for myself. For this egregious violation of the Family Constitution, I then get impeached (divorced) or censured (sleep on the living room couch for the next year). I suppose it is a bit late to divorce President Obama, besides being politically inadvisable, but maybe we could make him sleep on the couch for the rest of his term. I was thinking about the e-mail I received from Organizing for Action the other day; the one criticizing Speaker Boehner for claiming that Congress should be judged by the number of laws that are repealed. It occurs to me that the standard they are using to judge Congress is based on the number of bills passed rather than whether the bills are actually good ideas. Surely it is better to pass one good law than ten bad ones, and surely it is better to repeal ten laws known to be bad than to pass one law which may be good. I really wish we could somehow get away from the mentality that the solution to any problem is pass legislation quickly without thinking too much about whether it might have any unintended consequences. It is not too hard to imagine why politicians of every party prefer to be judged by quantity rather than quality and why they would rather not be judged by results. If people ever realized that they would be better off trying to solve their problems on their own, rather than expecting the government to do something, and that the sort of person who runs for office is the last one you should depend on, then most politicians would be out of a job. Axelrod: GOP is the party of ‘squeal and repeal’ (tv.msnbc.com) That works for me. I am still not certain who has come out ahead in the debt ceiling deal. Michael Barone seems to think that the Republicans go the better of the deal. In his latest column, courtesy of Human Events, he explains that the Republicans win when the debate is over spending cuts. First of all, the liberals seem to be a whole lot angrier over the deal. Democrats seem especially unhappy. They could have avoided the fight in the first place by raising the debt ceiling in the lame duck session in December, when they had large majorities in both houses of Congress. But they decided not to. Reid’s comments then suggested that he expected the issue to split the House Republicans, pitting the leadership against the 87 Tea Party-sympathizing freshmen. The leaders would have to agree to a tax increase in order to get a deal, with a party schism like the one that followed George H.W. Bush’s agreement to a tax increase in 1990. That didn’t happen. Instead Reid abandoned his demand for a tax increase. The reason, I think, is that he hasn’t had a 50-vote majority for a tax increase in the Senate, just as Senate Democrats haven’t been able to pass a budget. All of which left Barack Obama looking somewhat ridiculous when he called for more taxes in his televised speech Monday night. When you’re trying to show you’re leading and your followers have already gone off in another direction, you tend to look like something other than a leader. Some Democrats, in frustration, have said House Republicans are acting “almost like a dictatorship” or are using “terrorist tactics.” But in opposing tax increases, House Republicans are just being true to the voters who gave them in November 2010 a larger majority than they have won since 1946. Other Democrats have taken to blaming Obama. Robert Reich, labor secretary in the Clinton administration, decries an empty bully pulpit. Paul Krugman​, the trade economist who writes partisan vitriol for The New York Times, talks about a centrist copout. That’s what they get for being too clever. Here is the point of the column. All of which weakens Boehner’s bargaining position and may mean a final bill less tilted to Republican demands. 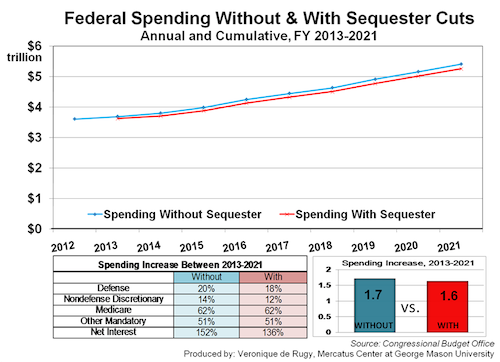 But, as many Democrats note, the battle is being fought over how much spending to cut, which means that Republicans are winning. The question is just how much. Democrats went into this fight with a precedent in mind, the budget fight between President Clinton​ and Speaker Newt Gingrich in 1995-96. The conventional wisdom is that Clinton won that fight and Republicans lost. That’s not quite right: After shifting to noticeably more moderate policies, Clinton was re-elected in 1996, but Republicans lost few House seats and held onto their congressional majorities at the same time. The difference this time is that Obama has not shifted policies noticeably, but instead has seemed to position himself as a complainer on the sidelines, asking voters to call their congressman. He has presented no specific plan of his own. 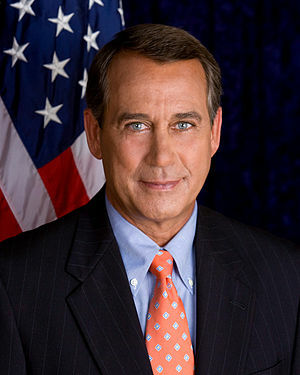 His chief of staff reports that he hasn’t spoken at all to Boehner lately. One major difference which Barone neglects to mention is the simply fact that with the loss of their monopoly over the news media, the Liberals are no longer able to completely control the narrative. Back in Clinton’s day, before Fox, the Internet, and when Conservative talk radio was just beginning to get big, Clinton enjoyed the advantage of being able to fight almost entirely on his own terms. If the media slammed the Republicans for being extreme and stubborn, there was really only Rush Limbaugh to tell the other side. Now, of course, Obama does not have that advantage and the fight is more equal. I think that on the whole the republicans did get the better of the deal. It’s no where near enough to avert eventual catastrophe but at least it’s a step in the right direction. The United States Federal Government is more than $14 trillion in debt. I think that one of the problems in our political discussions over the debt is that the human mind is simply not designed to comprehend such large numbers. We may understand them on an intellectual level but not on an emotional or “gut” level. I am not sure what the largest number we can really understand intuitively, maybe 20 or 100. Anyone can instantly tell the difference between 10 and 20 or 50 and 100, but when it comes to millions or billions, it’s harder to compare. The largest number the ancient Greeks and Romans used was the “myriad” which was 10,000. So 50,000 was 50 myriad, 1,000,000 was 100 myriad, and so on. This went up all the way to a myriad myriad which means 100,000,000. They didn’t really need any numbers larger than that. By the time of the Renaissance, mathematicians and bankers needed larger numbers. The precise meaning of large number names varies from country to country. I will be using American usage. A million is a thousand thousand. The word million was coined sometime in the 14th century from French and Italian. A billion is a thousand million. The word was coined around 1680 and means simply two + million. A trillion is a thousand billion. The word was also coined around 1680 and means three + million. I could go on with quadrillion, quintillion, and so on but I think you get the point. Anyway mathematicians and scientists who use really large number use scientific notation, which is beyond the scope of this post. All right now, let’s see if we can understand 14 trillion. Fourteen doesn’t seem to be a large number, does it? Well, let’s convert the trillions to billions giving us 14 thousand billion. That seems a bit larger. Now let’s go further down to millions. Now we have 14 thousand thousand million. One more step. Try thinking about 14 thousand thousand thousand. That sounds like a whole lot more than just 14 trillion. Whichever way you put it, that is a truly astronomical number. It is more than the number of stars in our galaxy. It is more than the number of galaxies in the observable universe. It’s a little more than half the distance to Alpha Centauri, the nearest star, in miles, but give Obama a second term and I’m sure we’ll get there. If any of this doesn’t help, here is a visual aid I got from life’s little mysteries. With all that in mind, the current controversy concerning the debt limit seems to me to be rearranging the deck chairs on the Titanic. The iceberg has hit us and we had better start plugging the hole.